Beijing, January 8, 2015 － Microsoft (China) and Alibaba Group Holding Limited (Alibaba Group) today announced the signing of a Memorandum of Understanding (MoU) to enhance the protection of Microsoft's intellectual property rights (IPR) on the two most popular e-commerce platforms in China operated by Alibaba Group, Taobao Marketplace (www.taobao.com) and Tmall.com (www.tmall.com). 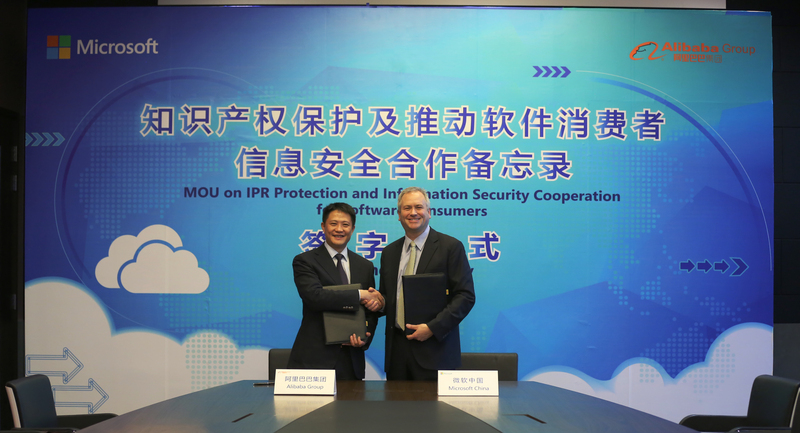 This cooperation will strengthen anti-counterfeit measures already in place on both platforms, to ensure that consumers are better protected from unwittingly purchasing dangerous counterfeit and unlicensed software. Both sides will collaborate to raise awareness among consumers about the threats posed by counterfeit and unlicensed software to their information security, privacy and personal data. The two companies will work to educate consumers through various online channels, such as Alibaba Group's e-commerce platforms, websites and online payment tools. "We are very pleased to partner with Alibaba Group to improve the customer experience online," said Tim Cranton, Microsoft's Associate General Counsel and Greater China Region's Chief Legal Counsel. "Microsoft is committed to protecting customers from downloading or purchasing non-genuine software that expose users to spyware, malware and viruses that can lead to computer crashes and network system failures, loss of personal data, and sensitive business information leaks. Not only will users' information security be protected, but legitimate businesses and innovators in China will also benefit from a safer and more robust e-commerce marketplace with safeguards to protect intellectual property rights." "Alibaba Group takes the issue of IPR infringement very seriously and we are constantly working with partners and stakeholders to enhance IPR protection on our platforms in order to tackle the problem of counterfeiting effectively," said Ni Liang, Alibaba Group's Senior Director of Security Operations. "Microsoft has been a great partner on this front, and we believe that this agreement will go toward building an orderly e-commerce environment where consumers' interests are best protected." According to a 2014 IDC White Paper, sponsored by Microsoft, The Link between Pirated Software and Cybersecurity Breaches, consumers will spend a total of $25 billion and 1.2 billion hours to address security problems caused by malware found on non-genuine software, while enterprises will spend $127 billion dealing with security issues and an additional $364 billion dealing with data breaches. It is in this broader context that Microsoft and Alibaba Group reached this MoU, in order to create a safer e-commerce environment where consumer rights can be protected. According to the MoU, after receiving notification from Microsoft, Taobao and Tmall will remove product listings suspected of offering counterfeit or unlicensed Microsoft products on Taobao Marketplace or Tmall.com, helping consumers and businesses avoid buying non-genuine products. Alibaba Group and its associated companies like Alipay will cooperate with relevant parties and provide necessary information to those consumers who mistakenly buy unauthorized software to receive compensation from the sellers according to relevant laws. The MoU demonstrates the deepening of a collaborative partnership between Microsoft and Alibaba Group that seeks to promote information security for consumers and businesses, protect intellectual property rights, and build a safe and fair e-commerce environment. Microsoft's cooperation with Alibaba Group dates back to April 2007 when Microsoft signed a memorandum of understanding with Alisoft as the two parties joined hands in providing information service for small- and medium-sized businesses. In December 2013, Microsoft launched its flagship online store on Tmall.com, the largest e-commerce platform in China with to promote genuine Microsoft software.